Info "Land me on the float! I can't swim, so don't fail me...or I'll make you pay!" Float Your Boat is a microgame in WarioWare, Inc.: Mega Microgame$! in the Anything Goes folder. 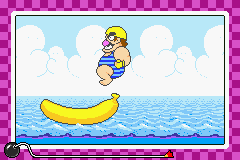 The player must drop Wario into the center of the floatie or his massive girth will push it out from under him. 1st level difficulty: The target is a long banana floatie. 2nd level difficulty: The target is a floatie with hearts. 3rd level difficulty: The target is a small rubber duck floatie. This page was last edited on February 2, 2018, at 04:44.